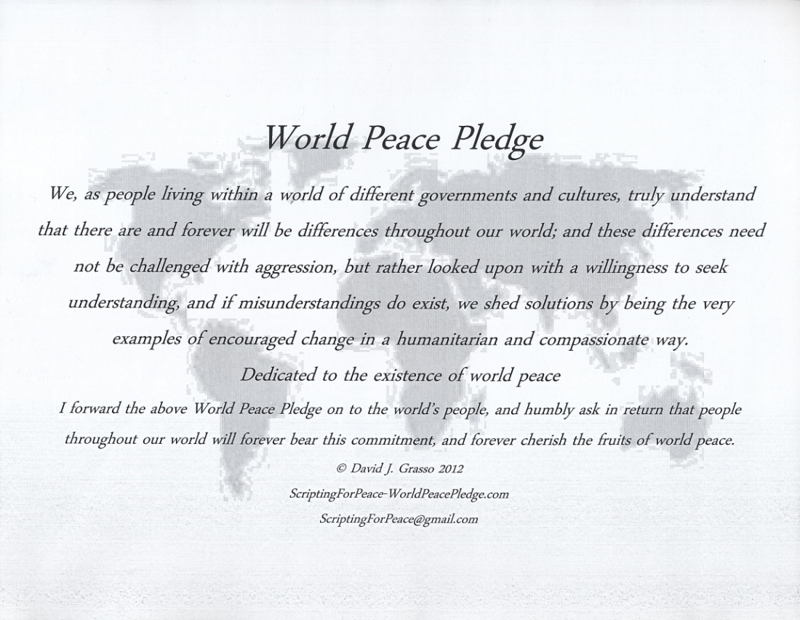 Uniting all world citizens, in the spirit of brotherhood, and throughout all nations, to achieve everlasting peace within our world; by encouraging all world citizens, of all ages, and within all cultures, to represent and lead a new era of peace throughout our world. We, as people living within a world of different governments and cultures, truly understand that there are and forever will be differences throughout our world; and these differences need not be challenged with aggression, but rather looked upon with a willingness to seek understanding, and if misunderstandings do exist, we shed solutions by being the very examples of encouraged change in a humanitarian and compassionate way. 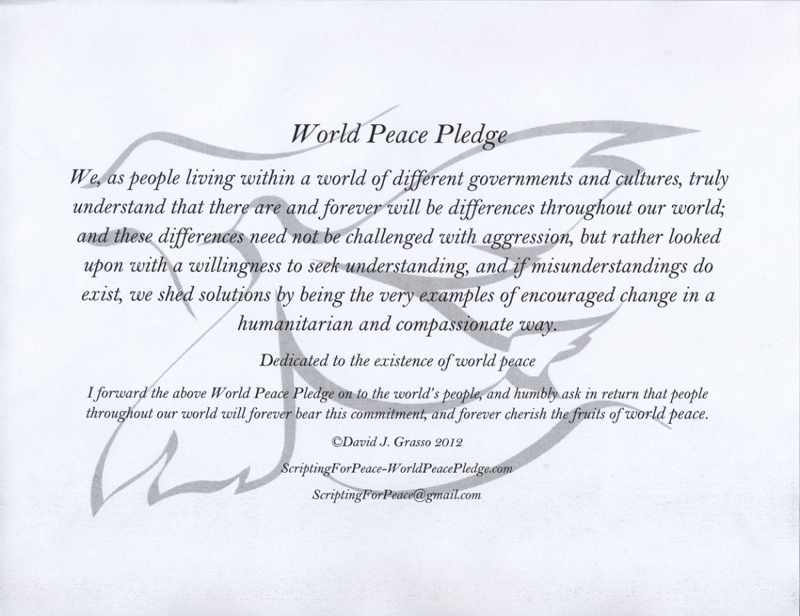 I forward the above World Peace Pledge on to the world's people, and humbly ask in return that people throughout our world will forever bear this commitment, and forever cherish the fruits of world peace. 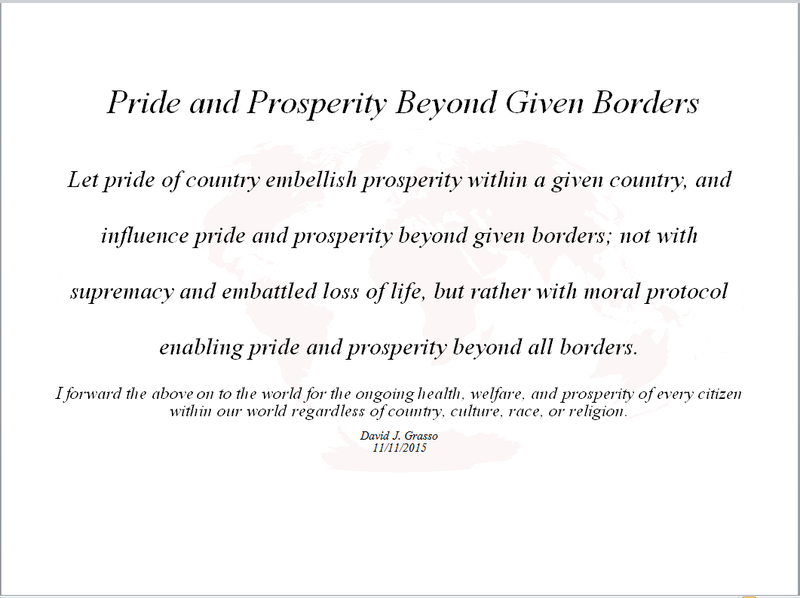 Let pride of country embellish prosperity within a given country, and influence pride and prosperity beyond given borders; not with embattled loss of life, but rather with moral protocol enabling pride and prosperity beyond all borders. I forward the above literary on to the world for the ongoing health, welfare, and prosperity of every citizen within our world regardless of country, culture, race, or religion. right click on document image below, save as picture, and print. right click on document below, save as picture, and print. Permissions forwarded by David J. Grasso for use of the above World Peace Pledge, and or entire website for world peace purposes, educational purposes, including language translations, and embedded script into permanent material forms such as various types of stone, bronze, etc., and other types of nonferrous and ferrous metals.